The beginning of October signals it’s time for soup, stew and chili season! I love the ease and simplicity of a one dish meal and the crock pot makes it all super convenient! 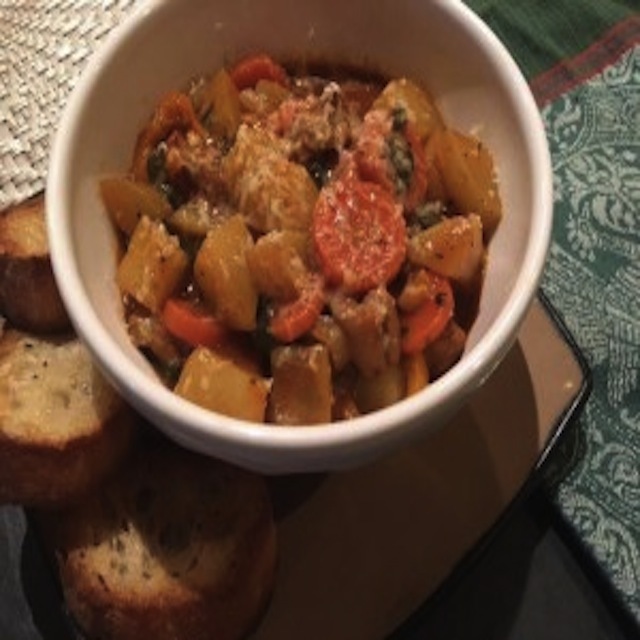 Yesterday I found a new crock pot beef stew recipe that is delicious! Below is the recipe as I found it on the internet. It’s called “The Best Crockpot Beef Stew”. And it is very good! I made a few simple changes based on ingredients I had on hand. My Mother has a little trick that is helpful for soups and stews. She keeps a plastic container in the freezer and whenever she and Dad have leftover rice, or veggies, she pops them in the freezer. When it’s time to make stew or soup, she pops them in. It’s the perfect way to use what you have and reduce waste! I guess that’s where the term “pot luck” came from! Combine beef, celery, carrots, onions, potatoes, salt, pepper, garlic, parsley, oregano, Worchestershire sauce, beef broth and tomato paste in the crock pot. (All but the last four ingredients) Cook on low for 10 hours or on High for 6-7 hours or until meat and veggies are tender. About half an hour prior to serving add the peas (or beans) and corn. Mix the flour and water together and add to the crock pot. This will allow the broth to thicken. Continue cooking covered until all is heated. Serve with warm toasted bread. Enjoy! DIY Money Saving Tip – A Challenge Jar!